He considered it a work of God's will. Rhonda agrees with him whole-heartedly. And though I'm not inclined to think in those terms, if I were, this would be a time I did. We boarded the train from Vienna to Prague, wrestling our bags into one of those wonderful European train compartments—seats facing each other with considerable leg room rather than the packed rank-and-file of airlines, an arrangement that encouraged conversation and community, rather than simply getting from one place to another. Facing your fellow passengers fosters a form of kindness: you are stuck with each other for the duration (this trip promised to be five hours), so any civilized person makes the best of it. Nodding, smiles, all the amenities. And there is nothing wrong with courtesy. It is an additional comfort on a long sedentary trip where the body wants to stir and stand and stretch. And the first encounter was charmingly polite. A man I would guess to be in his mid-forties helped us hoist the luggage into the racks above our seat. I thought it was a very gracious gesture from a fellow passenger, murmured my thanks, and was pleased to be addressed in fluent English. This had become one of the real amenities of our trip. The Hungarians and Austrians had been largely English-speaking (much to my relief, for as I mentioned in a previous entry, a spotty acquaintance with Romance languages didn't get you far in this part of Europe). 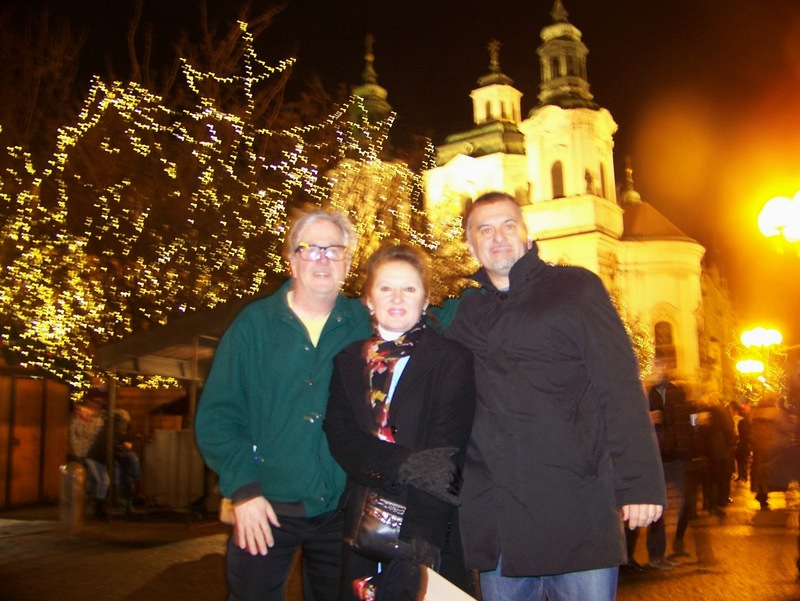 Our good fortune continued with these travelers to Prague. Vlado, the man I have mentioned, was a businessman who, it seems, had a particular focus in communications, in bringing together divergent interests—sort of the thing he would do on the train that evening. With him was his nephew David, a shrewd, witty young man of 17, and also the quiet Mojca, who was reading Haruki Murakami (which made me like her immediately) and drowsing a little: she was on her way to see her boyfriend, Vlado's son, Jan, who was pursuing graduate study at Charles University in Prague. Already it was a kind of unexpected group we were meeting—I began by assuming that David and Mojca were brother and sister, Vlado's son and daughter—but there was a different set of relationships, those involving outreach and extended family among the three of them, we discovered at once. Once we found ourselves among English-speakers and saw that we could talk with them, the question remained whether we would talk with them. Vlado and I initiated a polite back-and-forth: facing seats on a train may offer the chance for long conversation, but it's still up to the passengers to take the offer, and I think we both were mindful of honoring the other's privacy, if privacy was wanted. It turned out that conversation was welcome. Rhonda, who has a more attuned and welcoming social sense than I do, joined in, and it looked like there was going to be talk along the way from Vienna to Prague. I hoped it would entertain us: Rhonda brings out the best in people she talks with, so I had confidence that if we met the same kind of open regard from our companions, this would be pleasant travel. So while she and Vlado talked, I struck up a conversation with David—you can't teach in university as long as I have without liking smart young people and being curious about what they have to say. David, it turned out, was interested in film—Mamet and Tarantino were people he mentioned—and the talk ranged over Peter Jackson, Tolkien, Tarentino's Inglourious Basterds, while Vlado listened, contributed occasionally, then listened and smiled. Mojca and I talked about Murakami, which led me to Kafka and the part of my trip to Prague that was pilgrimage, a journey to the presence of one of the world's great writers (and, of course, one of my favorites). Rhonda talked travel experience (and a little politics) with our community, and the exchange moved readily and comfortably through a number of topics. have come when I remember the art of listening, but I'm afraid I forget it more often than I should. When we reached the Praha hlavní nádraží (the "main station"--I just like spelling it out in Czech), Vlado gave me his email address and phone number, offering any kind of favor or assistance we would need during our stay in the city. You don't presume on that hospitality, but I decided to email him when I returned to the States (which I did, beginning what I think will be a good correspondence) and figured that if our friendship continued, it would continue over the miles and through letters to each other. This is where God's will comes in. Or dependent arising, that Buddhist concept of the unfathomable and profound interconnection of all people and things. 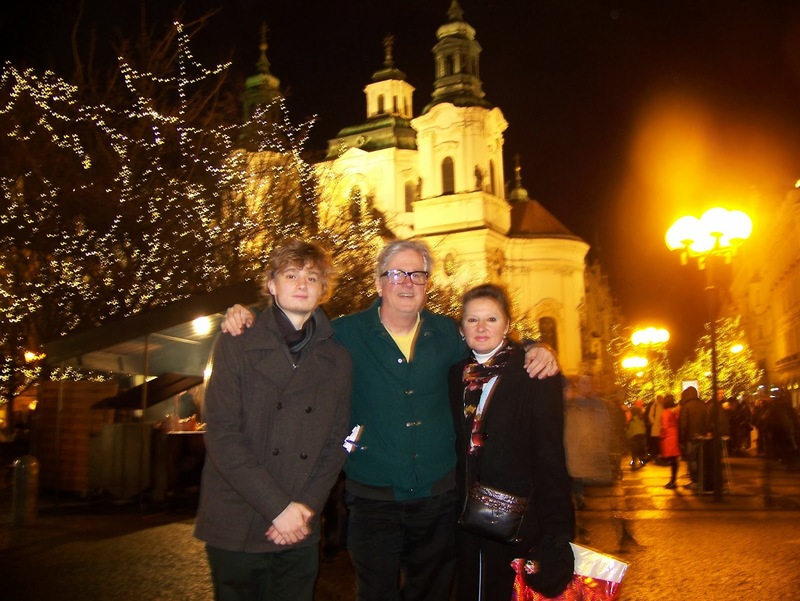 Christmas night, after we had eaten at a wonderful, small Czech restaurant not far from the Old Town Square, Rhonda and I walked over to the Winter Markets, the Astronomical Clock, and a promised tour of Haunted Prague, one of the more touristy attractions we had anticipated. More of the clock and the tour later: this entry is about the wonderful synchronous texture of things. Standing before one of the booths, contemplating souvenirs and taking in the smells of Czech food and mulled wine (yes, the stomach can be full while the nose indulges) I felt a hand on my shoulder, a voice proclaiming, "This time we need to take a picture". Vlado had spotted us in a crowded square, in a city whose population swells to two million during the Markets, and we enjoyed the reunion for over an hour of real camaraderie, of picking up the conversation where we left it. This time we met Vlado's son Jan, an amiable, extremely bright young man with whom I tried to keep pace during a rangy dialogue in which it was gratifying, as it always is, to find a young scholar still taken with ideas rather than careerism—a quality I love to find (and find more than outsiders would expect to find) in our own graduate students, that reminded me how much I love doing what I do. And all the while Vlado smiled, listened, spoke occasionally and always shrewdly, and treated us to mulled wine that settled well when we said goodbye to our friends and walked to the Astronomical Clock, to our journey through the back streets of Prague among its many ghosts.